Erin E. Evans (@heyerinevans) and I first met in the newsroom of The Hilltop, Howard University‘s student newspaper. Then, she was a budding journalist and editor at the paper, serious about her craft, and I was a PR girl, and deputy life & style editor, who had a passion for telling stories. Since that time, Erin has earned a master’s degree from New York University and has written for USA Today and the New York Times. Today, she’s the news editor at BET.com, a contributing editor at The Root and someone who should definitely be on your ‘ones to watch’ list because she’s just getting started. I recently caught up with Erin to get some insight into what inspired her to pursue a career in journalism, why she believes reading is a fundamental part of being a great writer and what she looks for in a PR pitch. 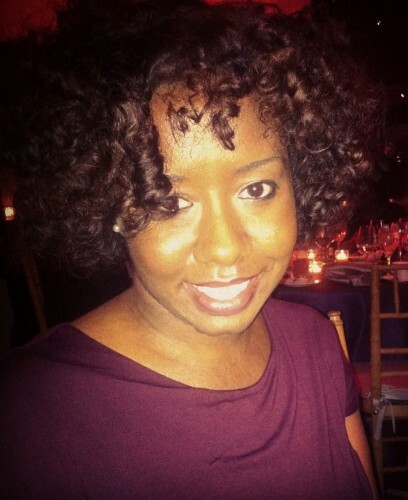 Hashtags+Stilettos: What are your day-to-day responsibilities as the news editor at BET? Erin E. Evans (Evans): I edit the majority of the news stories on BET.com, which includes political, national, health, sports and global content. I also assign stories, approve scripts and video content, and write about blacks and technology whenever I get a chance. H+S: What inspired you to become a writer? Evans: I tried to avoid being a writer for a while. My mother always pushed me to write more because I had a natural talent. She always knew that this was what I was going to do. Then, I joined the high school newspaper staff just because a friend kinda pressured me into it. Fell in love with writing news and feature stories. My high school newspaper teacher, Mrs. Cathey Weigel really helped me develop early on. And I’ve had great mentors and editors since then. H+S: What advice would you give to someone who wanted to follow in your footsteps? Evans: Read, read, read, and read some more. It’s so important to know about what’s going on in the news to be able to keep up with the conversation. It sounds simple, but the more you read, the better your writing will be. You’ll start to pay close attention to how your favorite writers form sentences, the style they use, and what writing techniques are effective. It’ll then translate into your own writing. H+S: What is the best career advice you’ve ever received? Evans: Aside from the advice I just gave, which I heard from my favorite professors at Howard [University], Professor Yanick Rice Lamb and Ron Harris, as well as my first journo boss, Lynette Clemetson. But also, don’t be afraid to use your voice. Whether it’s literally speaking up in a meeting or if it’s making sure your own personal voice and style comes across in your writing. No one wants to read a stale, “Bueller, Bueller” writer. Put some edge in it. H+S: How do you prefer to be pitched? Phone/Email/Social Media? No Preference? Evans: Don’t call me. I know that probably sounds terrible, but I’d much rather receive an e-mail or even a mention or DM on social media. Unless we’ve already worked together on numerous projects and have an established professional relationship, think twice — or three times — about calling me. H+S: What types of stories, content or projects are you looking for? Evans: Right now, we’re mostly looking for commentary about the news. A strong voice about the news of the day is held in high regard for many, if not most, online news organizations. H+S: When is the absolute worst time to send you a pitch? Evans: Probably during a breaking news event. If my mind is focused on something that’s going on in the news and rapidly developing, I will likely not see or respond to a pitch that has nothing to do with what’s happening in the news cycle. H+S: Biggest PR pet peeves? Evans: Sending me pitches that have nothing to do with what I cover or am looking for. H+S: Name one thing journalists can do to have a better relationship with PR people? Evans: Journalists and PR professionals can have really symbiotic relationships. We need you and you need us. I personally could do a better job formulating relationships with more of these professionals who have something great to offer. H+S: How can a PR person or brand get on your “always respond” list? Evans: Have a chat with me in person after we’ve discussed a few pitches or projects that are aligned with what I’m doing, whether it’s directly related to my 9 to 5 or related to my own personal projects. I might respond with a “not interested at this time,” but it’s better than me rolling my eyes at a pitch that doesn’t even fit what I’m looking for. I had the most fun writing or working on… I always have fun writing pieces about pop culture and TV for TheRoot.com. There’s 12 Things We Learned From a Different World, Googling “The Wire”, 11 Life Lessons from Living Single, Freaknik: The Musical: Bourgies, Beware. I could go on and on. The lists were always fun to research because you could find an endless amount of random information and minute details about ’90s sitcoms. I’d like to say I’m pretty well-versed on Black ’90s sitcom random facts. I’m most proud of… I worked at the New York Times for a semester while in grad school, and that was the most intense but rewarding experiences of my life. I was covering education, and one of the several stories I worked on was a longform narrative about an elementary school that was closing in my neighborhood. I went to the school and interviewed the principal and some of the parents and attended a few of the school’s protests to keep the school from closing. It’s probably one of the best things I’ve ever written. It didn’t end up getting published, but I got an A+ on it in my long-form narrative class. It’s something that I keep looking back at to inspire myself to keep writing and hitting the pavement. My dream interview would be with… Dead or alive? I love Toni Morrison, so would love to just listen to a few gems from her. If Zora Neale Hurston were alive, I’d love to pick her brain. iPhone, Android or Blackberry? iPhone. I have a BlackBerry for work, but I let it die all the time and really neglect it. I hate it. But, yeah. My 3 favorite mobile apps are… Spotify (I even pay the extra so I can stream music offline.) SnipSnap, cause I love to save a buck or two. Optimum, when I can’t find my remote, it’s right on my phone, and when I forget to DVR something, I can do it from there. A fun fact about me is… I was a debutante in high school, and I won the competition at the end for raising the most money. I was crowned queen, got a cape and a trophy. My mother HUSTLED to win that money. I even won the essay contest. You can find me… On Twitter @HeyErinEvans.